Hey gang, Valkor here. The past few weeks have been quite memorable in terms of nostalgia, filled with a bunch of 80's throwbacks; for instance "Manimal", a super cheesy show about a crimefighter who could shape-shift into different animals. Well it was just announced that Sony is making a live action/CGI film of the series. And then there's "Captain Powers", live action sci-fi series that was meant to sell toys that you could shoot into your television screen. That's getting a reboot in the form of "Phoenix Rising". And I'm actually excited for this series. What does this have to do with anything? 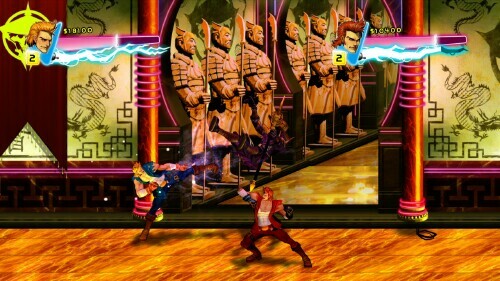 Well the gang over at WayForward have developed a title, Double Dragon Neon, that not only harkens back to my arcade days as a child in the 80's, but it's also a fun beat em up as well. Read on! 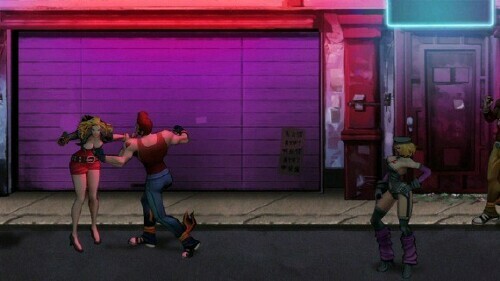 Double Dragon Neon is a reboot/remake of the original "Double Dragon" game that follows the original game's plot; Marian, who's just chillin outside the Dragon brother's garage, is suddenly gut-punched and hauled away. And now it's up to the brothers Jimmy and Billy Lee to save her. But rather than face off against a stream of thugs, things take a crazy twist after the second level tossing the brotehrs into space, facing off against a giant tank, avoiding the "Killacoptor", battling a gient plant (Little Shop of Horrors anyone? 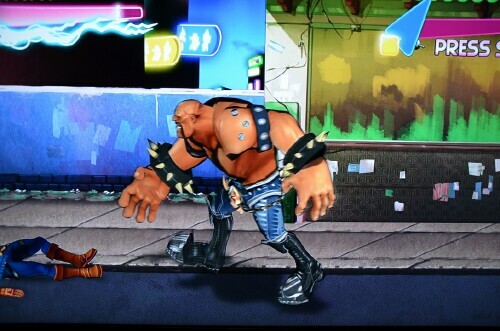 ), and eventually facing off against the game's protagonist, Skullmageddon, who is very reminiscent of 80's "Master of the Universe" cartoon baddy "Skeletor". 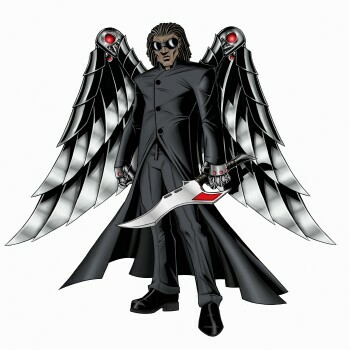 You'll battle Skullmageddon and his minions in ten levels of play. And you can replay each stage as often as you like. If you've ever gotten hands-on with any of the previous Double Dragon titles, then you're in familiar territory, however there are some new twist to the mechanics that make things rather interesting. You start off with a punch, kick, jump, and throw, which you can string into different moves such as an uppercut, spinning kick, and running/sweeping kick. Also Pressing R2 and L2 will initiate a run and a dodge. Billy and Jimmy can also pick up weapons from defeated enemies to aid them in their battle such as bats, whips, guns, bombs, boomerangs, and so much more. What's new to the series are assorted cassette tapes that you gain from defeated enemies or beating them out of various objects such as trash cans or mailboxes. 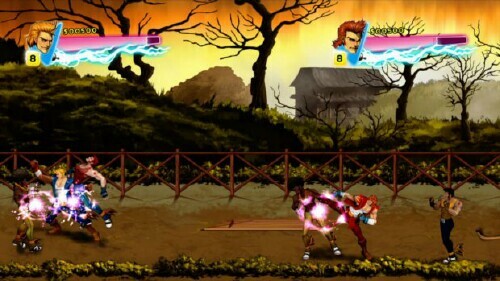 The cassettes unlock super moves that fall into one of two categories – Stance or Sosetsitsu. Stance affects the Dragon brother's health, magic, defense and attack power; each stance cassette augments abilities making the Dragons stronger or weaker in certain areas. Then you have Sosetsitsu, which grants the Dragons special abilities such as lightning attacks, fireballs, even a fiery dragon. You can update each cassette in one of three ways – you can collect money from fallen enemies or what you find in objects to buy upgrades, you can find the cassettes themselves from defeated enemies and objects, or you can collect mythril from boss enemies. Thankfully you can replay stages, but you'll have to replay an entire stage just to face off against a boss to get the mythril you need to update an ability. And with each update, the amount of mythril you'll need also increases. Finally, each cassette has a different tune associated with it. Just for the lulz, select "Healing Touch" and you'll hear a very familiar song… if you happen to know your Marvin Gaye. This leads us into the soundtrack; I know I'm jumping ahead with the TOV Breakdown, but Double Dragon Neon has one of the BEST soundtracks I've heard in a long time. When I first switched on the game and listened to the revamped Double Dragon theme… I didn't want to press start. It was just so beautiful! And then I heard the stage two, Mango Tango "Follow Me" song… and I can't get it out of my head! It's so catchy, so awesome, so… perfectly fitting! And it only gets better as you play along; when you defeat Skullmageddon, prepare not only to laugh, but to sing-a-long as his end song goes Karaoke to some of the silliest lyrics I've ever heard. And that's not a bad thing. 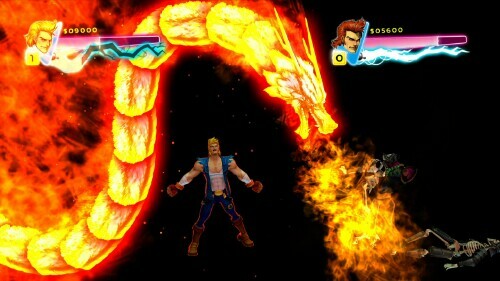 Double Dragon Neon can be played single player or two player bro-op (co-op), locally. Sorry no online co-op yet, but I believe WayForward is working to address the situation. I'm told playing co-op is a blast and I can't wait to try it. 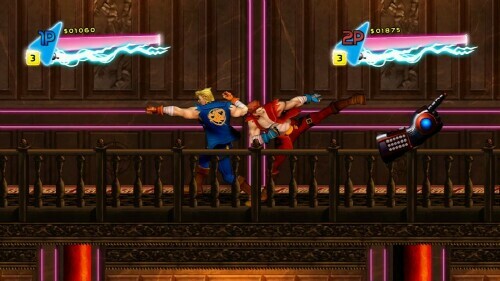 For instance, there are certain moves that can only be performed by two players. 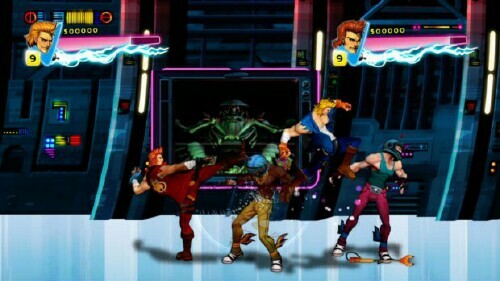 So after spending much time with the Lee Brothers, how did WayForward fare with this throwback filled with loads of 80's nostalgia? Let's take a look in the TOV Breakdown. Double Dragon Neon has got to be the most fun I've had in awhile. I love me some beat em ups, but the only one I've played religiously, even to this day, is Streets of Rage 2. And then Neon walked into my life… and now I can't take my hands off the game. It's not perfect, but it's damn good. Graphically, Neon is well polished with amazing detail on the characters and very fluid animation. It cracks me up how some characters have a defining 80s characteristic such as Jimmy and Billy's mullet action, another dude's huge afro with afropick sticking out, or one of the Linda's biker get-up. And plus points on dialogue; the characters spout some definite 80's cheese and even Jimmy (and Billy) are given 80's surfer dude accents. It's wicked funny! The backdrops are well designed with a great job on the colors and attention to detail. 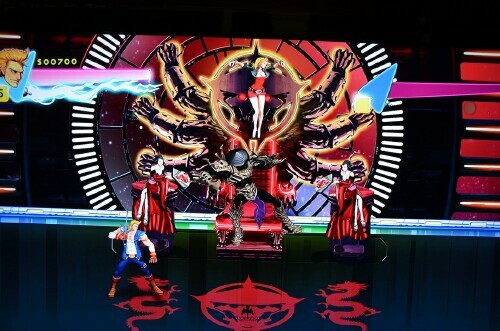 Each stage offers up a different look, though some animation in the background would have been a nice touch, but I can't really complain. And I've already expressed my love for the soundtrack; again its amazing stuff. Overall, Double Dragon Neon... it's awesome. Just awesome! But the game isn't perfect and there are a few distracting flaws. One of my biggest gripes with the game is with the extra lives. When I discovered the shop that sells the cassette upgrades as well as health restorer and extra lives, I thought this was great. I can rack up on lives and really give this game a workout. But when you leave the level where you bought the lives and then move on to the next stage, your lives go back to the initial two that you're given. So essentially I've wasted money buying all those extra lives and I can't use them in later stages. So why have the option to buy lives anyway? "But Val, won't that make the game too easy if you can buy all the lives you need"? Maybe. But if that's the case then increase the difficulty; don't just take away all the lives I've spent money on. It's... annoying! Next the controls are a bit sluggish. I'm not saying the game is unplayable, but sometimes walking appears a bit stiff, a punch you thought you nailed might have missed its mark, and that run... It's like a Flintstone character where they have to get warmed up before going into a sprint. Bimmy makes an appearance! Sure he's a cloned, brutish thug of Billy, but if you know where the name comes from, then you're in for a chuckle. Oh and his brother? Jammy? Nice! Double Dragon Neon is available now and even if you're not nostalgic for the 80s, the game is still loads of fun that any fan of the beat em up genre can appreciate! Double Dragon Neon is loaded with sharp graphics, excellent controls, and an amazing soundtrack that even given its fault, still a worthwhile purchase. And out of TOV 5 stars, I'm giving Neon a 4 and it's been Valkor tested, TOV Approved! The Good: Bodacious gameage bud! The Bad: Those lives that I bought? Useless!